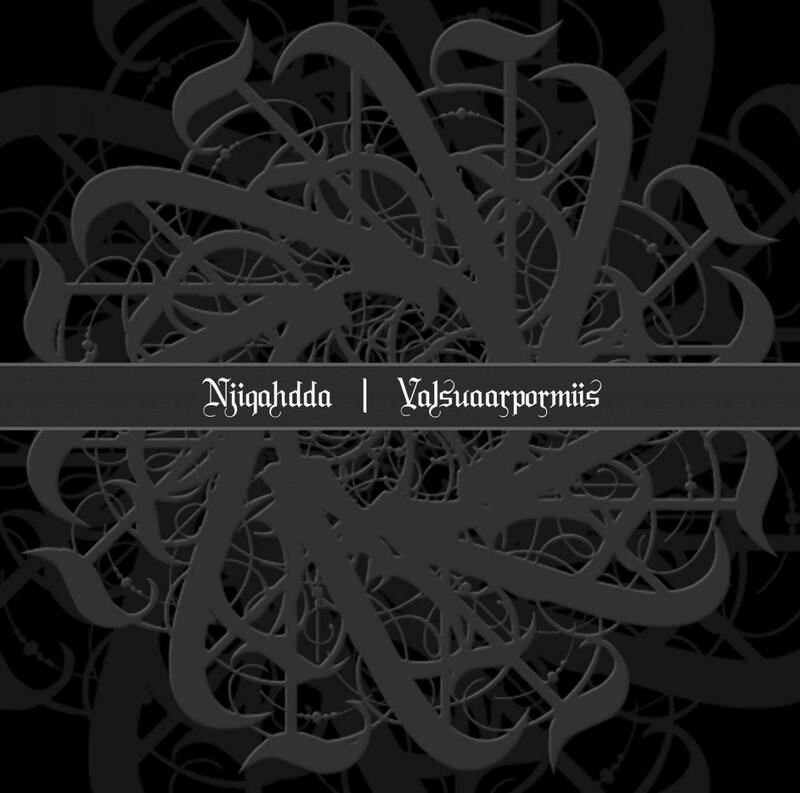 During what appears to be this mysterious duo's busiest year (I count 16 previous releases under the Njiqahdda/Njiijn name in 2010 alone), we see Njiqahdda showing no signs of slowing down. Along with fellow experimental US black metallers Benighted in Sodom, Njiqahdda follows the "quantity and quality" school, because the two can coexist (you just have to be talented). Running on the heels of their latest and most matured full-length, "Divisionals", we see Njiqahdda adding more and more influences to their music while still retaining their signature "wall of sound" style. Starting on a strummed-acoustic note with "Valsuaarposmiis I", it is very apparent that this duo is moving forward. In 15 and a half minutes, this crushing doom epic slowly builds into a blistering black metal opus with layers-upon-layers of guitars, vocals, and field recordings, reminding us that this still is Njiqahdda. Of course, having to mix things up, we see something reminiscent of a breakdown 8:15 in, a first for Njiqahdda (outside of their awesome Deftones cover on their free, internet-only release "Around the Covers"). Atmosphere has always been Njiqahdda's strongpoint, and "Val. I" is a strong indicator that, though this duo might release more albums than you can wrap your head around, they are masters of ambiance. Droning into the second track "Savantuu Savoari" we see something entirely new for Njiqahdda: seven minutes of distorted guitars and voice. No drums, no bass, just tremolo-picked walls of ethereal fuzz with /'s signature hyper-distorted voice. This song is very reminiscent, and perhaps an homage, to Russia's "kvlt" Blazebirth Hall movement, where each album would have a guitar and voice piece. "Savantuu Savaoari" lulls the listener into a deep, deep trance, and, though the concept of distorted guitar and voice alone for 7 minutes might seem tedious, the ever-changing textures and odd time signature (the whole track has sort of a 7/4 or 7/8 feel) will keep the listener at the edge of their seat. Fading in with more acoustic guitars (I'm loving the whole folk-feel of this EP), we are given "Valsuaarposmiis II," which is, in my opinion, one of the best Njiqahdda tracks I've heard yet, and I have most of their discography (which is a feat, I know). Taking a few nods from everyone's favorite, Agalloch, "Val. II" almost sounds like an outtake of "The Mantle" that was covered by Njiqahdda, not that that's a bad thing or anything. The acoustic guitar takes a front seat here and is a constant presence over the distorted guitar backing. 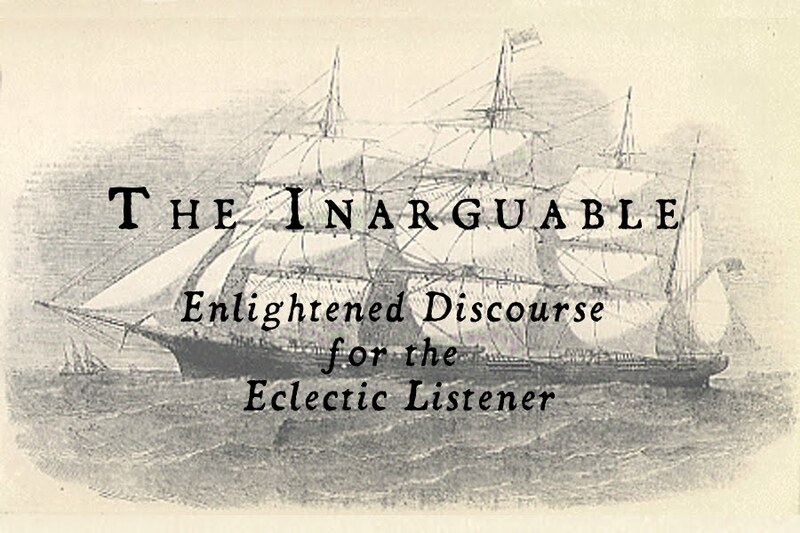 Everything moves with a distinct passion that we haven't yet seen in a Njiqahdda recording, that is to say that though Nji recordings in the past have been passionate, it seems that this style suits Njiqahdda the most. It would be very pleasing to see these fellows experimenting more with this folky style in the future (hint, hint, guys!). While I'm here, I might as well dispel a myth concerning Njiqahdda: though the drums are electronic, it's not a drum machine. Njiqahdda uses an electronic drumkit, or V-drums, meaning that all of the drums on every release up to and including "Valsuaarposmiis" have featured real drumming. Just thought I'd include that, since people seem to love to ridicule bands for using drum machines. 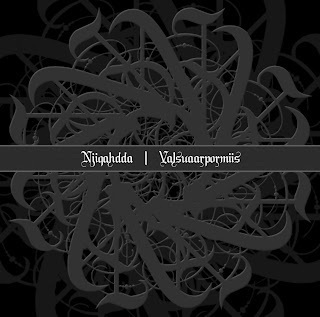 Anyway, "Valsuaarposmiis" is a very impressive and progressive release for Njiqahdda, showing new sides to the beast while still keeping its original core sound. I know I'll be picking up a copy at EEE Recordings, and 10 dollars for 37 minutes of quality music is a steal.